Ettore Bugatti followed his passion to create perfect automobiles ever since he created his first engineering composition at the age of 17 years old in 1898. In 1909 Ettore forever changed the world of car manufacturing when he decided to create his own path and own legend. He turned engineering into a form of art and strived for perfection on all levels like no one else. In Molsheim he set the foundation of one of the world’s most astonishing brands. It is the home of BUGATTI and where Ettore became “Le Patron”. Celebrating a rich and unparalleled 110 year history in 2019, we proudly look back while embracing an even more exciting future whilst continuously living the spirit of Ettore. Carlo Bugatti (1856–1940) was an internationally renowned, award-winning artist, designer and silversmith. His furniture was especially famous. Influenced by Art Nouveau, it was characterised by its utterly individual form, often imposing dimensions and use of highly refined materials. Ettore Bugatti (1881–1947) was the legendary founder of the Bugatti company and the designer of the most successful race cars and luxurious vehicles of his day. He was one of the major pioneers of both automotive engineering and the tradition of motorsports, and remains famous to this day for his visionary designs. Rembrandt Bugatti (1884–1916) was an internationally renowned sculptor and one of the pioneers of Art Deco. His artistic work mostly comprised cast bronze sculptures of animals. He was an exceptionally skilled craftsman whose works exuded natural beauty and a vivid power of expression. After school, Ettore became an apprentice at the bicycle manufacturer Prinetti & Stucchi. He was fascinated by the technology and mechanics behind motor cars, which were still in their infancy. Aged just 17, Ettore fitted a tricycle with an engine. This was followed by other models with engines placed in front of or behind the rear axle. He even entered these vehicles into some races. Following exhibitions in Amsterdam and Antwerp as well as reviews in international newspapers, Carlo Bugatti exhibited at the World Fair in Paris. His furniture won the silver medal. In 1901, Bugatti exhibited the first of his own cars at an international exhibition in Milan. He had built the car – the Type 2 – with the help of the Gulinelli brothers, and it won an award from the French Automobile Club. However, this project fell through when one of the Gulinelli brothers died. In the end, the licence to produce the car was sold to the company De Dietrich in Niederbronn, Alsace. Since Ettore was not yet 21 years old, the contract had to be concluded between De Dietrich and Ettore’s father. 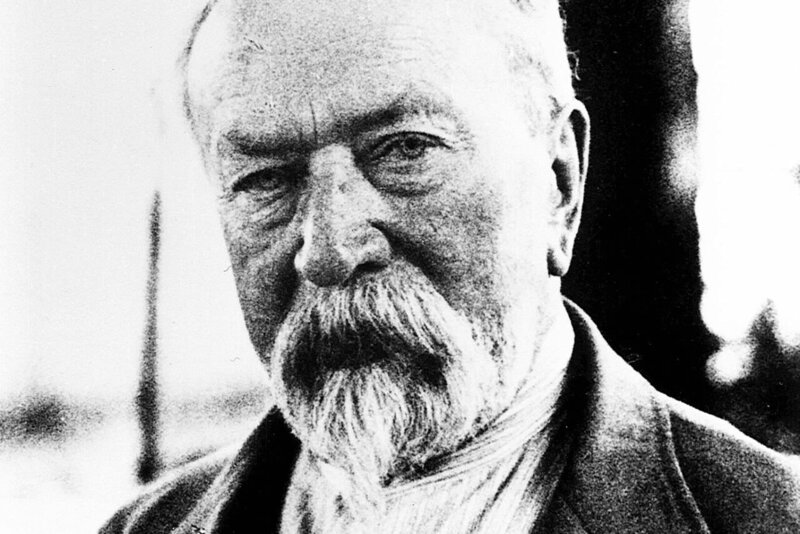 In 1902, Ettore Bugatti moved with his family to Niederbronn, Alsace, where Baron de Dietrich – enthused by Ettore’s first design – put him in charge of car production technology. However, since Ettore had not yet reached the age of majority, his father Carlo Bugatti had to sign the employment contract on 2 July 1902. The first race car designed by Bugatti was built in 1903. The chain-driven car was an upgraded version of the Gulinelli model, with a 12.9-litre displacement and a chassis with a tubular frame to circulate coolant. De Dietrich did not approve of Bugatti putting all his energy into race cars. Ettore’s boss believed he was increasingly neglecting the development of production cars. This resulted in the termination of his contract with De Dietrich. Afterwards, Bugatti designed a new car with a four-cylinder engine for Emil Mathis in Strasbourg. Ettore also fell out with Emil Mathis fairly quickly, and in 1906 he developed another 50 hp car, without any contractual obligation. He offered it to the Deutz gas engine factory in July 1907. Deutz manufactured the car under licence, and Bugatti became the head of the production division in Cologne. On the side, Ettore was working on his first small “Pur Sang”, the Type 10, in the cellar at his home in Mühlheim, Cologne. Jean Bugatti (1909–1939) succeeded his father Ettore as the head of Bugatti and designed many of the legendary brand’s classic models – such as the pioneering Type 57S Atlantic. He also headed the Bugatti racing team from 1935 and carried out test drives himself. With the backing of Pierre de Vizcaya, Bugatti started his own company in a disused dyeworks in Molsheim, Alsace. He arranged a loan with Darmstädter Bank to manufacture ten cars and five airplane engines. The Type 10 is the first “Pur Sang” developed by Bugatti. Fitted with a four-cylinder engine with a 1.3-litre displacement, the car weighed just 500 kg. In 1910, the first machinery was delivered to Molsheim and production began on the eight-valve car. Bugatti’s longstanding assistant Friederich began entering races in the initial prototypes. The production of the Type 10 continued until 1914. Ernest Friederich, Ettore’s right-hand man and factory racing driver, came second at the French Grand Prix on his first attempt – the only circuit race that Bugatti entered prior to the First World War. He achieved this result with an eight-valve Type 13, which outperformed a large field of competitors with significantly higher displacements. The Type 18 had a four-cylinder, five-litre engine with a power output of approx. 100 hp and a chain drive. The famous French fighter pilot Roland Garros owned one of these extremely powerful race cars for when he needed to travel by road. In 1916, he could drive on land at the same speed as in the air – around 160 km/h. The Bébé was launched in 1913 – a car developed by Bugatti and manufactured under licence by Peugeot. The little four-cylinder car with a displacement of just 850 cm³ could reach a top speed of 60 km/h. The Bébé went on to become a huge success. More Bébés were made than any other Bugatti model – several thousand units by 1916. The 16-valve engine of the Type 13 was developed before the First World War. Production began in Molsheim before the war and resumed in 1919, and proved extremely successful. Various versions with different chassis lengths were produced up until 1926 – the types 15, 17, 22 and 23. The car was nicknamed “Brescia” after spectacularly winning the top four spots there. During the First World War, Bugatti developed several airplane engine designs for the French and American governments. The licence fees for these engines provided Bugatti with the capital needed to resume car production in Molsheim after the war. Production increased and the number of employees gradually rose to over 1,000. 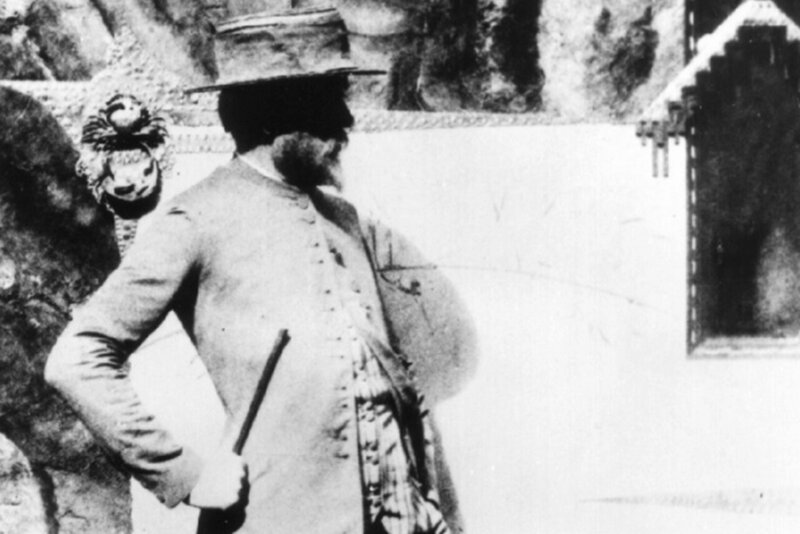 Rembrandt Bugatti was an introvert who as an adolescent was often closer to his “models” than his fellow human beings. He could not cope psychologically with the horror of the First World War. On 8 January 1916, Rembrandt Bugatti took his own life, aged just 31. On 29 August 1920, the 16-valve Type 13 achieved a resounding success at the Grand Prix de la Sarthe in Le Mans: Ernest Friederich won Bugatti’s first ever major race. This race – the only motor race that year in war-ravaged France – was intended as a repeat of the cancelled 1914 race, for which Bugatti had originally developed its new race cars. The Type 28 was only built as a prototype in 1921, but the large number of patents that were applied for paved the way for all subsequent Bugatti developments, especially the three-litre, eight-cylinder engine that appeared in this form for the first time. The chassis not only provided the basis for the design of the Royale, but also paved the way for all subsequent Bugatti touring cars. An upgraded version of the small Type 13 with 16 valves was produced for the 1921 racing season. The technical enhancements helped Bugatti to win the top four spots: Friederich finished ahead of de Vizcaya, Baccoli and Marco at an average speed of 116 km/h. From that point on, the 16-valve Type 13 was nicknamed the “Brescia”. The Type 29/30 was Bugatti’s first eight-cylinder race car. With a two-litre displacement, three valves per cylinder and an overhead camshaft, the engine achieved a power output of around 80 hp. The car was fitted with hydraulic brakes and boasted a revolutionary shape strongly reminiscent of a cigar. In 1922, the French Grand Prix took place right on Bugatti’s doorstep. This was the first time Bugatti entered the main Grand Prix rather than the voiturettes race. Bugatti had high hopes that his revolutionary “cigars” would perform strongly. De Vizcaya achieved a respectable second place. The race was won by Felice Nazzaro in a Fiat GP car. Bugatti’s first touring car was the Type 30. Over 600 units were produced and sold between 1922 and 1926. Bugatti cars were always designed to be suitable for racing, meaning the Type 30 could be used on both roads and racetracks. The photo shows the racing driver Elisabeth Junek behind the wheel. Bugatti entered a revolutionary-looking race car in the French Grand Prix in 1923 too. That year’s race was held in Tours. Bugatti used a bodyshell with a wing-shaped cross-section. However, the short wheelbase made it difficult to control, while the car’s shape tended to generate lift rather than downforce, so it’s no surprise that the Bugatti managed no more than a third-place finish. A year later at the French Grand Prix in Tours, Bugatti once again caused a stir with a revolutionary wing-shaped body with concealed wheels. This race car, known as “the Tank”, had a very short wheelbase and used an upgraded version of the eight-cylinder engine from the previous year. It came third at the race with Friederich at the wheel. Bugatti’s “Golden Age”: production began on the successful Type 35 race car. Ettore Bugatti introduced several innovations, such as the striking horseshoe shape of the radiator grille and the spoked aluminium wheels. Between 24 January and 19 September of the following year, by Ettore’s count the car achieved a total of over 500 victories in various races. With a total of over 2,000 racing victories over a period of nearly ten years, the Type 35 became the most successful race car of all time. No other car was as fast, beautiful and safe as the eight-cylinder car developed by Bugatti. At the Lyon Grand Prix, Ettore Bugatti erected a huge marquis. Hospitality had never been seen at a Grand Prix before. The six Type 35 cars that made their debut at the race in Lyon all had problems with the brand-new tyres, which hadn’t been vulcanised properly, and so the Bugatti team didn’t manage better than seventh place at the Grand Prix. In subsequent races, the various versions of the Type 35 won every race going until the early 1930s. The Targa Florio is one of the toughest and most famous road races in the world. Started by Vincenco Florio in 1906, the race’s 108-kilometre circuit ran right round the island of Sicily. There were five laps, for a total distance of 540 kilometres. Bugatti won this race an incredible five times in a row. In 1925, Bartolomeo “Meo” Costantini won the race for the first time in just under seven hours and 35 minutes in a Bugatti Type 35. In 1926, the 1.5-litre Brescia was succeeded by a car with the chassis and body of the Type 35 and a small 1.5-litre, four-cylinder engine. This car was dubbed the Type 37. At first glance, the engine looked like a four-cylinder version of the Type 28. Like the Type 28, it had a plain-bearing crankshaft instead of a racing crankshaft like the one used in the Type 35. The Type 40 was one of Bugatti’s most successful models. The small four-cylinder, 1.5-litre car was usually delivered with a “Grand Sport” factory body. The model was relatively affordable for a Bugatti, and around 800 units were made. During this period, luxury manufacturers normally only provided rolling chassis, since chassis were not yet self-supporting. In 1926, Bugatti started offering factory bodyshells too. This innovation was accompanied by the appointment of the automotive engineer and designer Joseph Walter. Bartolomeo “Meo” Costantini also won the 1926 Targa Florio. In the Type 35T, with an increased 2.3-litre displacement, he gave Bugatti its second win in a row. In 1914, Bugatti was already dreaming of making the greatest and most luxurious car of all time. In 1926, he finally made his dream a reality with the “Royale”. The “Royale” was the most expensive car of all time – and it still holds that title today. The eight-cylinder engine had a displacement of 12.7 litres and a power output of 300 hp. Unfortunately, this legendary car was launched right in the midst of the economic crisis of the early 1930s, and the high cost of developing it almost ruined Bugatti. Only six “Royale” units were ever made, but there were a total of eleven different bodyshells for these six chassis. Only three of the six were sold to customers. The Type 43 created a sensation when it was unveiled in 1927. Inspired by the Type 35, it had a “Grand Sport” body, but the interior was slightly more spacious than in the Grand Prix models and it had a “real” windscreen. In 1927, Emilio Materassi won in a Bugatti Type 35C, which was fitted with a compressor for the first time. This upgrade helped Bugatti to maintain its winning streak. In late 1927, Bugatti unveiled a new model with a three-litre, eight-cylinder inline engine that superseded the two-litre Type 38 in the Bugatti line-up. In addition to the standard bodyshells produced by the factory, the Type 44 was also offered with many special bodyshells produced by renowned bodyshell manufacturers. The Type 44 was Bugatti’s most successful eight-cylinder model ever. On 6 May 1928, the French racing driver Albert Divo won the 540-kilometre course in a time of seven hours and 21 minutes in his Bugatti 35B, ahead of Giuseppe Campari in an Alfa Romeo. Bugattis also came in fourth and fifth place, with the famous drivers Louis Chiron and Elisabeth Junek from Czechoslovakia at the wheel. Albert Divo won the Targa Florio for the second year in a row. This time, he drove a Bugatti Type 35C and managed a time of just under seven hours and 15 minutes. The British driver William “Williams” Grover won in a Bugatti T35B, which was painted green, the British racing colour. This historic first win at Monaco was repeated three times in the years leading up to 1933. On 4 March 1929, the first Bugatti Owners Club was founded in Britain. Today, it is the oldest brand association in the world. Since its founding, the Bugatti Owners Club has organised the Prescott Speed Hill Climb in Gloucestershire, UK. The Type 50 was launched in 1930. It was an upgrade of the existing touring cars with a 4.9-litre compressor. The engine of the Type 50 featured a completely new design, with two overhead camshafts and two diagonal valves for the first time. In comparison with the Type 46S, capable of approx. 160 hp at 3,500 rpm, the Type 50 was capable of approx. 225 hp at 4,000 rpm, making it significantly more powerful. René Dreyfus won the Grand Prix in a Bugatti as a privateer, ahead of Bugatti factory drivers Louis Chiron and Guy Bouriat. Dreyfus won thanks to an additional fuel tank, which enabled him to complete the race without making the final pit stop. The pinnacle of Bugatti race car manufacturing was the 2.3-litre, twin-cam Type 51. The new race car was supposed to have been launched in 1930, but it wasn’t until the 1931 season that it finally appeared. The only differences from the Type 35B were the angled valves on the cylinder block, the two overhead camshafts, the one-piece wheels, which were more stable than the Type 35 and no longer had removable rims, and, on the outside, the lower-set inlet manifold pressure relief valve outlet on the bonnet and the twin fuel caps. Louis Chiron, born in Monaco and one of the most famous and successful Bugatti racing drivers, won in a newly developed Bugatti Type 51. In 1931, Chiron and Varzi (car no. 4), Divo and Bouriat (no. 5) and Conelli and Rost (no. 6) entered the 24 Hours of Le Mans. The Type 50 cars had an engine displacement of 4,972 cm³ and a power output of 275 hp at 4,500 rpm. The regulations stipulated that any car with a displacement of over 1,500 cm3 had to have four seats. The bodies were lined with black artificial leather. The Bugattis raced in black, because Ettore Bugatti had fallen out with the top motorsport authorities again and consequently did not want to race in the French racing colour of blue. In 1931, the Type 55 – a touring car with a Grand Prix engine – superseded the Type 43. Bugatti used the lighter engine from the Type 51. It could be ordered ex works with two different bodyshell options. Jean Bugatti designed both the incredibly beautiful two-seat roadster body and the so-called faux cabriolet. The Type 53 was the one and only car with four-wheel drive designed by Ettore Bugatti. In 1932, Bugatti used the tried-and-tested engine of the Type 50 for the Type 53. It was also the only car made in Molsheim with independent front suspension. In 1931, Bugatti made a tender offer for a high-speed train to the French national rail authority. The car manufacturer won the tender in the face of competition from established companies. Jean Bugatti drove the “Autorail” on its official test runs at Gallardon, located between Paris and Chartres, and reached a speed of 125 km/h on his first attempt. World record attempts were made in 1933. With Jean Bugatti in the driver’s cabin, a new record speed of 166 km/h was set over a 24-kilometre section of rail near Le Mans. On 30 October 1934, a speed of 192 km/h was achieved over a distance of six kilometres. The Jean Bugatti Roadster handed over to textile industrialist Armand Esders on 4 April 1932 was the first “Royale” made for a customer. The car cost an incredible 700,000 francs. Monsieur Esders had already made an advance payment of 200,000 francs in October 1931. The car, which was painted in two shades of green, was provided without mounted headlamps at Monsieur Esders’ request, as he did not intend to drive at night. However, the headlamps were included separately. While Ettore Bugatti managed the upcoming production of railcars in the face of a continuous decline in orders, Jean Bugatti took over as head of the racing team and design division. He designed many new models in the following years, including the Type 57 and Type 59. He also upgraded the engines of the Type 50 and Type 50B. The Italian Achille Varzi began in pole position at Monaco and took the lead, closely pursued by Tazio Nuvolari. This was the first race where the grid positions were not allocated randomly, but instead assigned based on the best practice time. The two cars were neck and neck from the first lap to the last. After suffering an engine malfunction during the final lap, Nuvolari pushed his Alfa Romeo over the finishing line to come second. However, he was disqualified for receiving outside assistance. The Bugatti Type 59 was the last of the classic Bugatti Grand Prix cars. Although its enlarged engine displacement of 3.3 litres was significantly greater than the series production version, this classic Grand Prix race car was no longer capable of competing properly with rival German and Italian race cars, which received state funding. Between 1934 and 1939, around 660 units of the legendary Type 57 were made. The car could be ordered ex works with different bodies, including convertible and coupé versions. For the first time, the factory offered five different body versions for a diverse range of requirements. The official names of these five versions came from Alpine passes, hillclimbing races and Greek mythology: Galibier, Stelvio, Ventoux, Aravis and Atalante. The Type 57S was based on the more sporty Type 57 model, which was launched in 1936. The Type 57S’s chassis was 32 cm shorter than the Type 57’s and it had a significantly lower ground clearance of just over 12 cm. This low clearance was achieved by running the rear axle through the chassis. Changes to the engine gave the S version significantly more power, with 170 hp compared with the Type 57’s 135 hp. Only 43 Type 57S units were made in total. Based on the Type 57S, Bugatti developed a racing version with a streamlined body and fully concealed wheels. Due to the dominance of the German racing teams Auto Union and Mercedes, the French Automobile Club (ACF) decided to make the French Grand Prix into a sports car race. Needless to say, their reason for doing so was to ensure a French win. Bugatti was perfectly prepared for the new situation, and with the extremely aerodynamic-looking Type 57G Tank won not just this race, but also the Grand Prix de la Marne in Reims. Incidentally: the Type 57 used the beautiful piano wire wheels from the Type 59. 1936 permanently changed the world of Bugatti. Ettore, who had always had a special relationship with his workers and paid high social security contributions and above-average wages, regarded the strike, which spread to the factory from outside, as a personal insult. He put some distance between himself and the workers, and from that point on worked almost exclusively from Paris. The result of the strike was a reduction in pay for all new employees. The idyllic world of Molsheim was never the same again. With its first victory at Le Mans in 1937, Bugatti revived the more successful years of the 1920s. The Bugattis achieved the fastest average speed ever recorded – 137 km/h. The winners, Jean Pierre Wimille and Robert Benoist, won in a streamlined Type 57G Tank with a modified Type 57S chassis. The car was distantly reminiscent of the Type 32 Tank from 1923. Despite serious financial problems at Bugatti, Jean was able to persuade his father to enter Le Mans. Ettore only wanted to take part in the race again when the speed record set in 1937 was broken. With just one car, a Type 57 chassis with a compressor and a Tank body similar to the one used in 1937, Bugatti won the 24 Hours of Le Mans again. This time, Jean Pierre Wimille and Pierre Veyron were at the wheel. With an average speed of almost 140 km/h, they actually beat the record set by Bugatti in 1937. On 11 August 1939, Jean – the patron’s designated heir – died while test driving the very same car that had won Le Mans just a few weeks earlier. A few days later, the Second World War began. In 1940, the German occupying forces forced Ettore Bugatti to sell the factory in Molsheim for 150 million francs to the German entrepreneur Hans Trippel, who was already manufacturing amphibious craft in the factory. After the war, the factory in Molsheim was returned to the Bugatti family. Tentative attempts were made to revive production, but due to a lack of funds Bugatti was unable to develop a new product range. The first race that Ettore Bugatti entered after the war was the Grand Prix du Bois de Boulogne in Paris. Ettore entered the successful racing driver Jean-Pierre Wimille in the race in a Type 59/50B. Wimille won on his first attempt. Drained of energy by disputes surrounding the return of the Bugatti factory, in spring 1947 Ettore Bugatti visited Molsheim and the site of his son Jean’s fatal accident for the last time. Back in Paris, he contracted the flu and then suffered a stroke. On 21 August 1947, Ettore Bugatti died of pneumonia at a military hospital in Paris at the age of 66. After the death of Ettore Bugatti, his heirs appointed Pierre Marco as the new managing director. The company produced a small series based on the Type 57, which was now named the Type 101 and only featured minor modifications. Roland Bugatti (Ettore Bugatti’s son from his first marriage) and René Bolloré jointly took over management of the company. The company provided maintenance for old cars from the pre-war years and produced engines for the military. Bugatti finally ceased production. In total, approx. 7,900 cars had been produced in the 47 years since Ettore Bugatti founded his company. This image is one of the few pictures taken of the Molsheim factory halls. The Bugatti expert Hugh Conway published a list of all Bugatti owners. This was the catalyst for the Schlumpf brothers’ collection: they wrote to all the owners and were able to acquire an estimated 50 Bugattis as a result. The following year, the brothers also bought the remaining 18 B Bugattis owned by the family, as well as all prototypes, engines and components. This included Ettore Bugatti’s personal “Royale”. They also acquired a collection of around 30 more Bugattis from John Shakespeare in the USA. Bugatti was purchased by the company Hispano-Suiza, later renamed Messier-Bugatti. This company still produces vendor components for the aviation industry in Molsheim today. When the Schlumpf brothers unexpectedly shut all their textiles factories due to liquidity problems, the workers and their families protested. The two brothers fled to Basel to avoid prosecution. Consequently, the collection in Mulhouse passed into state ownership, and the Musée National de l‘Automobile was opened in July 1982. “Schlumpf Collection” was later added to the name, in reference to the collectors and textile industrialists Hans and Fritz Schlumpf. In total, over 120 Bugatti exhibits were assembled in Mulhouse. The entrepreneur and car dealer Romano Artioli purchased the rights to the Bugatti trademark and founded Bugatti Automobili S.p.A. However, this company was based not in Molsheim, but in Campogalliano, near Modena in northern Italy. The EB 110 was unveiled in Paris on 15 September 1991 to mark Ettore Bugatti’s 110th birthday. The 12-cylinder car featured four turbochargers, four-wheel drive and approx. 550 PS. A total of approx. 140 units were made. Bugatti Automobili S.p.A. cease their business in 1995. The Nuremberg-based sports car manufacturer Dauer Racing GmbH took over the production of the EB 110 and continued to sell it under the name Dauer EB 110. Around ten more EB 110s were built. In May 1998, Volkswagen AG acquired the rights to the Bugatti brand and unveiled the EB 118, a two-door four-seater coupé, in October of that year. The 18-cylinder sports car, designed by Giorgetto Giugiaro (Italdesign), paved the way for subsequent models. After the unveiling of the EB 118, three more studies followed in 1999: in the spring, Bugatti began by presenting the EB 218, a four-door saloon, at the Geneva Motor Show. This was then followed in September by the EB 18/3, named after former Bugatti racing driver Louis Chiron, at the IAA in Frankfurt. Just a few weeks later, a supercar that was intended to usher in a new era for the brand debuted at the Tokyo Motor Show: the EB 18/4 (pictured). In 2000, Bugatti presented the EB 16/4 Veyron, a modified study of the EB 18/4 from the previous year, at motor shows in Detroit, Geneva and Paris. The eight-litre mid-engined car, named after the French racing driver Pierre Veyron, featured a 16-cylinder, 630 hp W engine. 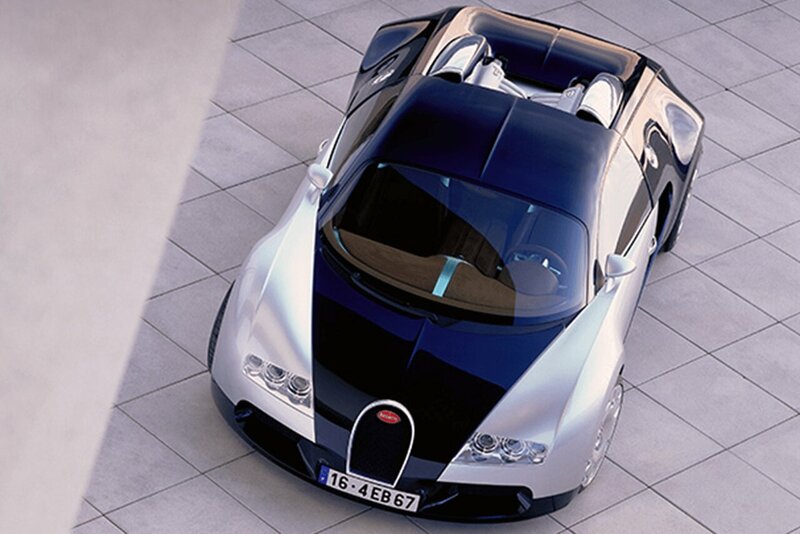 In 2001, Bugatti presented the study of the Veyron 16.4 at the IAA in Frankfurt. The concept car boasted 1,001 hp (736 kW), an eight-litre displacement, four turbochargers and a torque of 1,250 Nm. It was decided that year to initiate series production based on the study. The production model shared the same name. There was only one possible place to manufacture the Veyron: Molsheim in Alsace (France), the birthplace of the Bugatti brand. Following a refurbishment of the traditional company headquarters “Château St. Jean”, the new production facility – known as “the Studio” – was completed in 2005. Production of the Veyron began in autumn 2005. Bugatti produced a superlative-quality car at the brand’s headquarters, just as company founder Ettore Bugatti once did: with 1,001 hp, a top speed of over 400 km/h and a sprint from 0 to 100 in less than three seconds, the Veyron exceeded the performance of any car previously seen by the automotive industry. In the Veyron 16.4 Grand Sport, the Bugatti designers and engineers perfectly combined a 1,001 hp supercar with the lifestyle of open-top driving. The Grand Sport was unveiled at the Concours d’Elegance in Pebble Beach (USA) in August 2008, and was quick to find admirers. At an auction run by Gooding & Company, chassis number one was sold for 3.2 million US dollars. To mark the company’s centenary, in September 2009 Bugatti unveiled four special Centenaire models of the Veyron at the Villa d’Este Concorso d’Eleganza. The Centenaire models harked back to the Type 35 and Bugatti’s glorious racing history. Just as in Ettore Bugatti’s day, the models were presented in the racing colours of the countries that competed in motorsports at that time: blue for France, red for Italy, green for Britain and white for Germany. On 26 June 2010, the Bugatti Veyron 16.4 Super Sport broke the speed record for street-legal production sports cars. Observed by the GUINNESS BOOK OF WORLD RECORDS™ and the German regulator TÜV, the Super Sport achieved a top speed of 431.072 km/h, making it the fastest production sports car in the world. After breaking the world record in early summer 2010, in August the Veyron 16.4 Super Sport had its world premiere in Pebble Beach (USA). The world’s fastest production car boasts a power output of 1,200 hp (882 kW) and max. torque of 1,500 Nm, and can sprint from 0 to 100 km/h in 2.5 seconds. The Super Sport is regarded as the high point of the Veyron series. At the 2012 Geneva Motor Show, Bugatti unveiled the open-top version of the 1,200 hp Super Sport: the Bugatti Veyron 16.4 Grand Sport Vitesse. With a top speed of 410 km/h, it is the fastest production roadster ever. In April 2013, the Bugatti Veyron 16.4 Grand Sport Vitesse achieved a top speed of 408.84 km/h with its roof down, making it the world’s fastest production roadster. The Vitesse World Record Car Edition, produced specially for the world record run and limited to just eight units, received its world premiere shortly afterwards at Auto Shanghai. It quickly sold out. The readers and editorial team of the British car magazine Top Gear (BBC) voted the Bugatti Veyron “the greatest car of the past 20 years” from an overall list of over 50 cars. Over 100,000 readers voted.